In 1957, University of Kansas’ 7-foot giant Wilt Chamberlain was the most intimidating collegiate player in the United States. 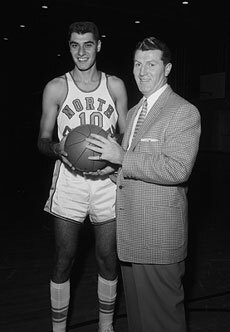 But University of North Carolina’s 6’5” Lennie Rosenbluth was the country’s best player. The Tarheels’ consensus All-America led UNC to a 1957 undefeated––32-0–– season and the NCAA championship. Rosenbluth registered 27.9 points and 8.6 rebounds per game during the regular season. The Helms Hall of Fame named him “Collegiate Player of the Year”. North Carolina ranked No. 1 after the 1957 season, and its basketball success not only brought the campus to the forefront of the college sports, it also legitimized the credentials of the Atlantic Coast Conference (AAC). The ‘57 NCAA title also launched the Tarheels long and successful winning tradition and reputation as the ‘cradle for development’of basketball superstars. In 1956, he again led the Tarheels in scoring, 26.7 ppg, and his All-America honors were split between various first and second team selections. It all came together for UNC and their star forward in 1957, as Rosenbluth and the University basketball program produced the first undefeated AAC team to win the NCAA. The ’57 final game match-up produced what is considered to this day one of college basketball’s greatest battles, as Rosenbluth’s Tarheels defeated Chamberlain’s Kansas Jayhawks 54-53 in triple overtime. The UNC forward scored 20 points in the championship final, was the tournament’s overall top scorer, 28.0 ppg, and was named to the All-Tournament Team. In 1989, when the NCAA selected five ‘All-Decade Final Four’ teams, Rosenbluth was named to the ‘All-1950s’ team, along with such future professional legends: Chamberlain, Elgin Baylor, Oscar Robertson, Bill Russell and Jerry West. He is also a member of the Helms College Basketball Hall of Fame, and is listed as one of the “100 Greatest College Players of All-Time”. Lennie Rosenbluth’s honors include: three-time All-ACC selections (1955-1957); 1957 ACC Player and Athlete of the Year; MVP of the '57 ACC Tournament; All-Tournament at three Dixie Classics. He and Antawn Jamison, UNC's most-recent superstar, and Duke's Christian Laettner are the only collegians to be named NCAA National Player of the Year , ACC Player of the Year, ACC Tournament MVP, and NCAA regional MVP in the same season. As of 2005, the North Carolina court legend still holds eight Tarheel basketball records, including most points in a single season (895), and highest single season average (28.0). Rosenbluth’s three-season total of 2,045 points still ranks 3rd all-time at UNC, despite his career’s absence of a freshman season and the three-point shot. Rosenbluth was selected by the Philadelphia Warriors in the first round of the 1957 NBA draft and played for the Philadelphia Warriors 1957-1959.